'Discover a movie which hits home about love, friendship, dreams and life. A movie that you'll be talking about long afterwards. Experience something special, something romantic, something honest.' 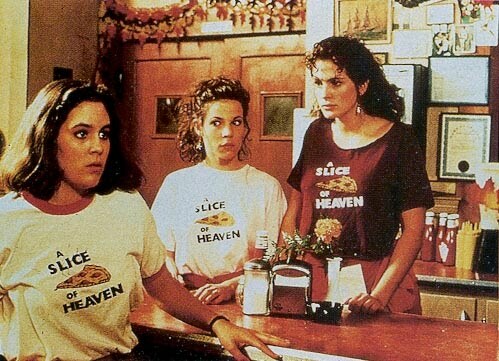 --Reads the tagline from 'Mystic Pizza'. This month we're taking a trip back to the 80's. 1988 to be exact, with the movie 'Mystic Pizza'. The film, starring Annabeth Gish, Lili Taylor, and an introduction of the actress who would come to be known as "America's sweetheart": Julia Roberts, quietly captured a place in the heart of a generation with its tender, funny, and at times, heartbreaking coming-of-age tale. While the residents of their small Connecticut town, Mystic, are becoming increasingly mystified by the irresistible pizza served up at the parlor where the three girls work, they discover that finding out who they are can be just as bewildering. Many of us remember seeing this movie for the first time. Break out the aqua net. Don your best neon. And bring your appetite. We're heading back to Mystic for "A slice of Heaven." How will YOU mystify? With lots of mozzarella and roasted vegetables, Maybe even fruit. Or something unexpected, like f*%king lobster. Don't be afraid to get creative. Or stay true to a classic favorite. The possibilities are endless. 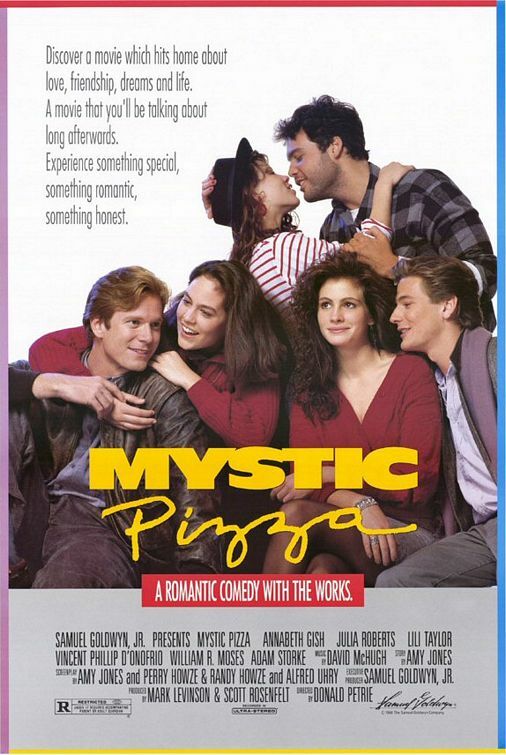 Send your entries for October's Flick: 'Mystic Pizza' between Now and October 31st to IgobyRee at aol dot com to be included in our delicious roundup. So excited! I watched it a week ago..and I'm gonna watch it again before I decide what I'm making. And as Deb reminded me...it's not just the pizza...there's the f*cking lobster to think about, too ;) LOL!!! Great pick, Ree! Yeay! I love pizza...LOL...that's true! I forgot about the lobster! I've always wanted to make F#$%king lobster! My Chocolate Pizza post is up here. Seemed fitting to combine all of these ladies together.